Cape Breton Island's ambassador of step dancing, Mary Janet MacDonald has been dancing and teaching her way all over north America and Scotland for years. Her love of dance, knowledge of the tradition and warm outgoing personality have made her Cape Breton's favorite stepdance instructor. This is a step by step instructional video for beginner to advanced dancers. Besides showing most of the traditional steps seen throughout Cape Breton, the tape contains a couple of special features including, by popular demand, complete instructions and demonstration of the Inverness square set. 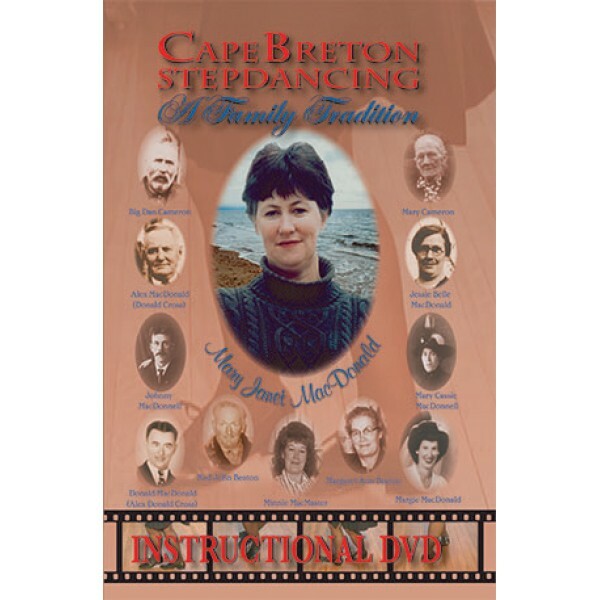 Included is a short interview with Mary Janet in which she talks about the stepdancing in Cape Breton, and how it has always been her family's tradition. The interview is illustrated with footage shot in Cape Breton and Scotland, including an uncut performance by Mary Janet and her family, shot during the Celtic Color's Dancer's Dream Concert. The theme, "A Family Tradition", continues with the musicians who play for the instruction. The fiddlers are Mary Janet's nieces, Dawn and Margie Beaton, and on piano, cousin Janet Cameron. "A Family Tradition" is a wonderful way to enjoy learning stepdancing and keeping fit. Before you know it, you'll be up with the best of them, at Glencoe, West Mabou, or for that matter anywhere else in the world.